The mathematical constant, e, is the constant value (approx. equal to 2.71828182845904), for which the derivative of the function exis equal to e.
The Exponential Function (written exp(x)) is therefore the function ex. 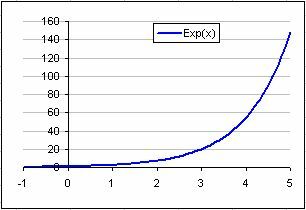 The Excel EXP function calculates the value of the mathematical constant e, raised to the power of a given number. where the number argument is the real number that you want to raise e to the power of. The following spreadsheet shows four different examples of the Excel Exp function. For further examples of the Excel Exp function, see the Microsoft Office website.